Michael Spencer, veteran blogger from that vanguard of online Christian punditry, internetmonk.com, has linked to a great comparison of the Gospel with false religion from the site, The Journey. It was developed from Tim Keller’s material and usefully exhibits the radical disparity between the mentality of a legalistic-orientated religion and the wonderful freedom and hope we have available to us in the Gospel. I’ve reworded it slightly where I thought the theology was perhaps not perspicuous enough and the language slightly pedestrian. I obey – therefore I’m accepted. I’m accepted – therefore I obey. The locus of my motivation is uncertainty and fear. My motivation issues from a grateful joy. I obey God to know and enjoy God – to delight and resemble Him. When the storms of misfortune and adversity press upon me, I am angry at God or myself, since I believe, like Job’s friends, that anyone who is good deserves a comfortable life. When circumstances in my life go bad, I struggle but know that I am held by God and that my comfort is not ultimate, but my character and relationship with Him is. All the punishment I justly deserved fell on Jesus but through God’s loving discipline I am called to a greater reliance on Him and to the precious reminder that I am his child (Heb 12:8). When I face criticism I can be furious or devastated because my practice and actions are the principal barometer of my perceived spiritual health. It is fundamental for me to think of myself as a ‘good person’. My positive self-image must be maintained at all costs. When I face criticism I struggle because I want to live as Christ lived – however criticism does not undo me. I know I am not a good person, and that my identity is not built on my record or my performance but on God’s love for me in Christ. I can take criticism. That’s how I became a Christian. My prayer life consists largely of petition and it only intensifies when I am in a time of need. The main purpose in prayer is to control my life and my environment. My prayer life is both the fountain and convergence of my praise and adoration for God. The central purpose in prayer is for fellowship and to grow closer to my Shepherd. My self-view swings between two poles. If and when I am living up to my standards, I feel confident, but then it is easier to be proud and unsympathetic to failing people. If and when I am not living up to standards, I feel humble, but my confidence decamps – I feel like a failure. My self-view is not based on a view of my self as a moral achiever. In Christ I am simul iustus et peccator — simultaneously sinful and lost yet accepted in Christ. I am so bad he had to die for me and I am so loved he was glad to die for me (Heb 12:2). This leads me to deeper and deeper humility and confidence at the same time. There’s no room for swaggering nor sniveling. My identity and self-worth are centered on the one who died for His enemies, who was excluded from the camp for me (Heb 13:12). I am saved by unmerited, unalloyed grace. So I can’t look down on those who believe or practice something different from me. Only by grace I am what I am. Since I look to my own pedigree or performance for my spiritual acceptability, it is easy for my heart to rest in idols of accomplishment. It may be my skills, my moral record, my personal discipline, my social status, etc. I absolutely have to have them because they serve as my ground of hope, meaning, happiness, security, and significance – whatever I may say I believe about God. I have many good things in my life—family, work, spiritual disciplines, etc. But none of these good things are ultimate to me. None of them are things I absolutely have to have. And so there is a limit to how much anxiety, bitterness, and despondency they can inflict on me when they are threatened and lost. I clutch onto God alone, He is my rock and sole source of hope. The original can be downloaded (in pdf form) here. Okay, so Joss Whedon’s internet sci-fi opera may not have managed to distingrate the interwebs into fizzling silicon ether and monkey dust as claimed – but hyperbole aside, Dr Horrible’s Sing-Along Blog has been a phenomenal success. The musical has been fiendishly popular on iTunes and its three acts all remain currently in the top 5 downloads for US users, even after a week (and yet still not available through that store in this country; kiwi knaves with a penchant for diabolical schemes in song-form must turn their evil scowls elsewhere for now). Whedon’s original concept for the webisodes were hatched during the writer’s strike and as a thumb-nosing exercise at the hegemony of the corporate moguls in the television world (though paradoxically, his new Dollhouse series will be with the same company that unforgivably spurned Firefly). With the Dr Horrible musical, Whedon hoped to alter the perceptions commonly held towards web content and work towards shaking up the dominant models of disseminated entertainment (“Dr. Horrible is about putting power in different hands—the wrong hands”). I’d say he’s done that. Not only has Dr Horrible had fans donning oversized rubber gauntlets and scrawling freeze ray designs on the walls of their padded cells, it’s been fruitful enough to take to the bank. TV Squad took out their calculator and deduced that if it (not unrealistically) reaches one million downloads: after paying the principal actors each 100k, Whedon will saunter away with 2.6 million in green gravy. And this is not including the sales of the DVD. And I should add, our jubilation at his success is not merely vicarious. The more prosperous his industry-usurping efforts, the more of Dr Horrible and the equine-led Evil League (with honourable mentions to Fake Jefferson and Dead Bowie) that we get to enjoy. In fact, the discussion of a sequel seems to be gaining momentum. 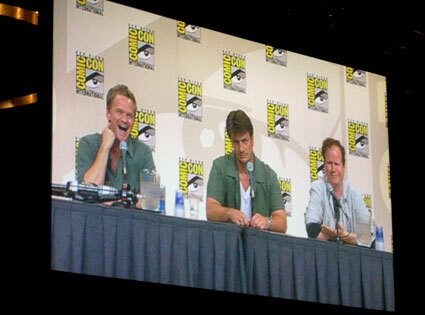 At the Dr Horrible panel at Comic-Con, Whedon was more optimistic about a further installment of the villainous video-blogger. Whedon mentioned that “the idea is that there will be another part” but was reticent on specific details. Neil Patrick Harris has already spoken of his interest in doing a follow-up but with Whedon now more certain, the prospects sound good. Which has this fan excited. 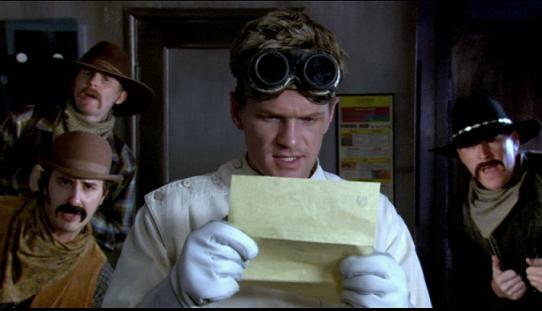 Dr Horrible didn’t break the Internet but it came close to breaking hearts with its forlorn, more-tragedy-than-comedy final act. Whedon is brilliant at coalescing the randomness and seemingly arbitrary nature of life and death within his plot lines, but this particular turn seemed too melancholic. With some greater narrative space, I’m hoping he can restore a greater balance of the other genre elements and perhaps, leave my heart a little less rent. Details about the DVD were also revealed at the panel. Whedon said that Dr Horrible, in that format, will be out before Christmas with a commentary sung by the cast (“Commentary: The Musical”) that includes uniquely composed songs. In the coming weeks, Whedon will be releasing the soundtrack for the webisodes and also organising a competition for fans. The ten best winning video submissions for mock entry into the Evil League of Evil will be attached with the extras on the DVD. Also, lastly, for the really obsessive types, Dr Horrible’s remote control from Act one can played with here. The prop for the webisode was designed by Nathan Fillion’s friend PJ Haarsma (and actually pressing some of the buttons will take you to material involved with their project Kids Need to Read, a charity organisation for furnishing libraries with books). In our age of new and “improved” theological beliefs that blow like chaff through the church, it is both illuminating and inspiring to draw from the deep well of saints who have faithfully gone before us, and, as Paul said, ran their race well until they saw Jesus face to face. Perhaps my favorite dead mentor is the great English reformed Baptist Bible preacher, Charles Haddon Spurgeon (1834–1892). 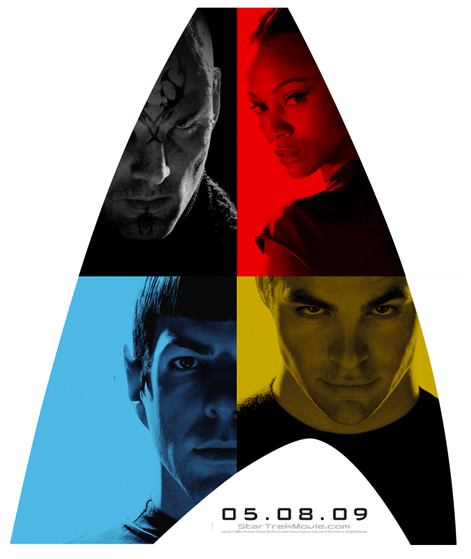 A set of posters for the still-distant Star Trek film have been released on its official site. We get our first polychromatic view of Kirk, Spock, Uhura and Nero; the skulking, misunderstood Romulan. With 288 days till its opening, and the inscrutable decision not to front at the years epicenter of geekism – the San Diego Comic Con, Paramount will be hoping this might appease its fulminating fans. Of course, my allegiance falls to star-flung quadrants other than those purveyed by the Star Trek franchise. But say what you want of my blinkered fealty to midichlorians over dilithium crystals, the aging Star Trek license has long been eclipsed by more agile newcomers and successful reinventions of sci-fi mythologies. It is difficult to get past the fact that the last Star Trek film was a bland, insipid failure. The crude aim to replicate the satisfying denouement of the Shatter-generation crew in The Undiscovered Country felt uninspiring and formulaic. And for me, the slaying of Data in the third Act merely represented an exhausted act of self-parody, only further underlying that a zero-G vacuum had supplanted the heart of Gene Roddenberry’s original vision. However, if someone is gonna revive the franchise and chart it into temerarious new places, its current director, J J Abrams, just might be the one. He is smart and inventive, and the current golden boy of Hollywood with two hugely popular shows on ABC. Although his last film was deemed unsuccessful by a media mostly blinded by Cruise hate, Mission Impossible III plundered a sizeable box office haul and wasn’t terrible by any measure (it remains as my favourite installment of the trilogy, easily). Whether the Star Trek opera can accommodate the kinetic, realistic direction Abrams is taking it, however, remains to be seen. Here’s the poster, resized and recropped into the Federation Delta badge from the larger images you can get on the site. If Hegel is right and the philosophy of a generation is its thought contained, then its art is its conscience conveyed. Where life obscures, art has the potential to peel away the unnecessary, permitting us to feel what routine and repetition have numbed us to. In tactile artifacts of colour and cadence, art can reveal what reality has hidden and open us up to the affective. Chesterton warned of the potential for madness in the philosopher who hopes to cross the infinite and squeeze the heavens into his own head. 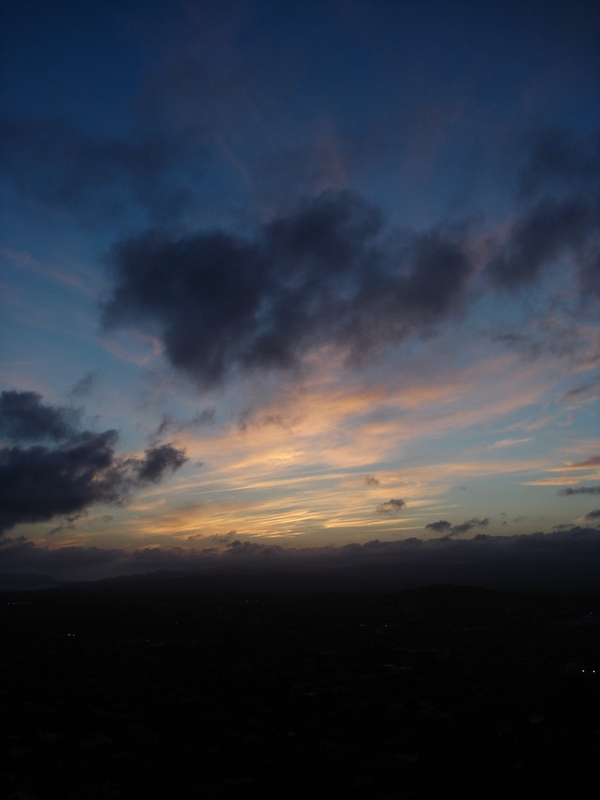 The artist however, he said, recognises well his own limits, yearning merely to raise his own head into the heavens. It is the artist who seeks the transcendent without the impossible intention of taming it. In good art, we may witness traces of this pursuit. In great art, we are impelled to feel this momentum ourselves. French director Julian Schnabel, in The Diving Bell and the Butterfly, has crafted a film that enables us to feel the heartache and hope of the human spirit. Based on the similarly-titled memoir, the film depicts the story of Jean-Dominique Bauby, a French fashion magazine editor. Played persuasively by Mathieu Amalric, Bauby falls hard from the coruscating heights of a disencumbered, wanton existence when he experiences a stroke and becomes paralysed by what is known as ‘locked in syndrome’. This bizarre condition renders Bauby unable to move or speak and only able to communicate through blinking his left eye. With such a delicate subject matter, it is easy to imagine its mishandling by other directors. Schnabel, however, is deft and apollonian, offering an experience that is memorable and not manipulative. 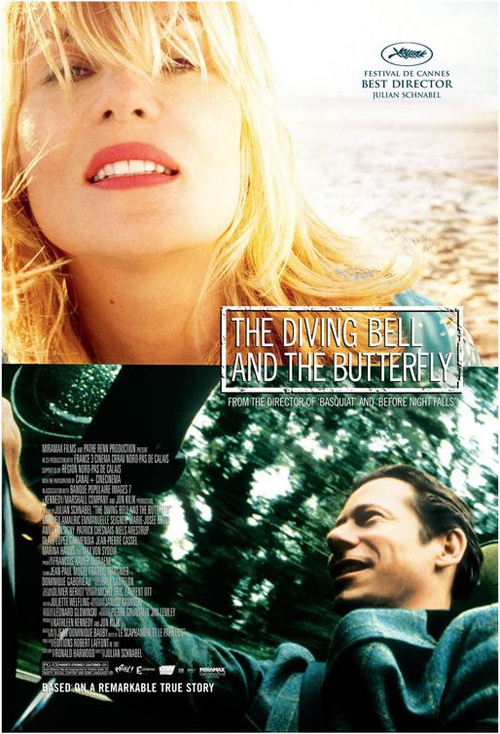 The Diving Bell and the Butterfly is the third film from Schnabel, and also his third film with a strong biographical bent. Before filmmaking, Schnabel was a painter and sculptor, and it seems hard to deny that his work shows an obvious impetus to examine the relationship between the artist and his craft. Arguably, the tragic story of Bauby has granted him an even greater canvas to work with and Schnabel here probes deeper, more fundamental issues that are universal to us all. This is perhaps well demonstrated in how the film is shot. In the opening frames of the movie, we are committed to Bauby’s first person perspective. We are not a floating eye; we are not distant, cool observers. Bauby’s predicament is ours. We must endure the limited viewpoint and watch and listen to the slow process of rehabilitation. It is not until almost forty minutes into the movie that Schnabel permits us to glimpse Bauby, such are the director’s scruples about permitting any recoil at the inhumanity of his condition. Schnabel further presses the impermanence and fragility of life with parallels to Bauby’s aging father (including a tender scene where Bauby remembers helping to shave him) and a friend who was held hostage in Beirut. It is in fact the friend, in a visit with Bauby, who encourages: “Hold fast to the human inside of you, and you’ll survive.” And this, I think, is close to the thematic agenda underlying Schnabel’s efforts. In witnessing the cruel imprisonment of Bauby in his own body, we’re forced to ask what it is that defines our humanity and therefore ultimately gives us hope. Is it our ability to move and interact that determines who we are? Is it in expression and in communicating that we gain meaning? Or is it something else? The butterfly of the title offers something of a clue. For although the film is constrained by Bauby’s perspective, it is also liberated by it. In focusing on the inner life of Bauby, Schnabel is freed to roam among Bauby’s thoughts of the past and the unreal. Scenes from the hospital and of therapy are effectively spliced with memories and fantasies: glacier’s spearing into turquoise seas, a daydream of a lavish banquet, the recollection of romantic holidays and more are all worked into the narrative without occluding it. As a portrait of an artist, it is as much a study of Schnabel’s artistic imagination as it is Bauby’s. Though completely still, Amalric is able to present Bauby with a dynamic, undimmed energy. His performance is honest and humourous at times: all the more convincing, as we follow Bauby’s slow embrace of the freedom of his imagination. Within his unresponsive body, Bauby is yet able to rediscover hope and purpose in communicating his thoughts and relaying his story. Upon the errant wings of this imagination, his soul finds a weightlessness, and in that he finds the quiddity of what it is to be human. Art cannot close the gap between the ideal and reality. Indeed, for a moment it lifts us above reality and induces us to live in the realm of ideals. But this happens only in the imagination. Reality itself does not change on account of it. Though art gives us distant glimpses of the realm of glory, it does not induct us into that realm and make us citizens of it. Banvinck is right – art alone cannot atone for our guilt or assuage our deepest pains. I was disappointed that director Schnabel dismissed religion too easily. In the film, Christianity assumes the shape of well-worn stereotypes: it preys on the desperate, it is excessively moralistic (a Jesus glow statue ruins Bauby’s night with a girlfriend) and is no better than the metaphorical suit of iron that pulls Bauby to the ocean floor. But even art requires a framework that only religion can provide. The kindling of our imagination can be invaluable, but it must be within the context of a transcendent moral law and the shaping of our conscience by the Spirit of God (Phil 4:8). After opening at Cannes exactly a year to its release here in this country, the film arrives with multiple awards and high acclaim from the festival circuit (though it comes with its trophy-flush armfuls cruelly light of an Oscar – denied by the Academy’s ‘one-country-one-film’ policy). And for the most part, Schnabel deserves every accolade. His film is a haunting and abrasive journey into an interior world of both human lostness and courage. While it works more effectively at raising questions than it is at answering any of them, Schnabel has yet delivered a cinematic tale that is of unique, quiet beauty.